State forestlands in Oregon were acquired in different ways, and the two types are owned by different entities – the Board of Forestry and the State Land Board. There are 657,000 acres of Board of Forestry lands, mostly found in the Tillamook, Clatsop, Santiam, Sun Pass, and Gilchrist state forests. Most of these lands were acquired by the state in the 1940s from counties that accepted already-logged lands from private owners to pay for back taxes. In return, counties receive a share of the revenue from logging these state lands – 63.75%. The rest of the logging revenue goes to the State to administer the land. There are 124,000 acres of Common School Fund Lands owned by the State Land Board, mostly within the Elliott State Forest. These lands were given to Oregon upon statehood from the federal government. Revenue from logging these lands goes to the Common School Fund administered for public education in the state. The management plans for these forests have long lacked conservation measures that would protect salmon and wildlife from impacts of logging and road building, and conservation groups have been working to ensure that these plans secure better environmental protections in balance with revenue from timber harvest. 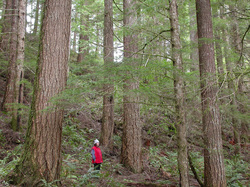 More info on conservation efforts in the Tillamook and Clatsop State Forests at http://forestlegacy.org/. The Elliott State Forest is 82,000-acres of publicly owned forest in Oregon’s Coast Range just north of Coos Bay that has historically been logged to provide funding for Oregon’s Common School Fund. Tying logging revenue to school funding was envisioned at a time when old-growth forest and wildlife seemed limitless, but after a century of unsustainable logging practices this program is increasingly in conflict with Oregon’s modern conservation values. Today only 41,000 acres of the Elliott’s old-growth forest remains, making the public forest one of the largest uncut areas left in the Oregon Coast Range. Litigation over the impacts to threatened wildlife forced ODF to halt logging in mature and old-growth forests and focus instead on young plantations. But the state’s expectation for revenue from the forest meant pressure to log more. Proposals to sell off the Elliott to turn a profit were the subject of major public outcry. In 2017, the State Land Board voted to keep the Elliott public, but management of this forest is still being debated. More here. In addition, language governing the Board of Forestry lands says that these lands are to be managed to achieve the greatest permanent value to the state – which includes social, economic, and environmental benefits. State managers have an obligation to conserve and protect a variety of natural resources and values on these lands. Board of Forestry forests are meant to achieve “healthy, productive and sustainable forest ecosystems that, over time and across the landscape, provide a full range of social, economic and environmental benefits to the people of Oregon”. The state must at least comply with the Oregon Forest Practices Act (FPA). The Board is subject to stakeholder and public involvement on all forest harvest plans. ODF is expected to incorporate conservation values into their annual harvest management plans. Roads on state forestlands are used to access timber sales, special forest products, and forest management activity sites. They also provide access for fire suppression and recreation. There are many miles of inherited old roads and old railroad grades now used as roads that need to be improved, reconstructed, or decommissioned to meet road maintenance standards and prevent damage to water and soil resources. The Forest Practices Act requires ODF lands to locate logging roads where there is a minimum risk of materials entering the water, and a minimum disturbance to riparian areas, channels, lakes, wetlands and floodplains. Road location must also avoid steep slopes, high landslide hazard locations, as well as avoid wetlands, channels, and floodplains. Unfortunately there are numerous examples of detrimental roads across the state forest landscape. Oregon's Department of Environmental Quality (DEQ), as supported by the Clean Water Act, is responsible for the management of Oregon’s water resources. Oregon’s Forest Practices Act specifies the use of “Best Management Practices” for forest operations in order to minimize water degradation. Oregon DEQ is responsible for water quality assessments every two years. Approximately 13,326 miles of Oregon's streams and rivers, and 30 lakes do not meet the water quality standards that support drinking water, recreation and fisheries. The Oregon Endangered Species Act (ESA) defines species jurisdiction in State Forest Lands. Oregon’s endangered species list includes nine species or populations that do not appear on the Federal ESA. Unfortunately, the Oregon ESA provides a more narrow definition of “take” or harm to listed species and does not reach privately owned lands. The Department of Forestry is required to apply for a permit through the National Oceanic and Atmospheric Administration (NOAA) and U.S. Fish & Wildlife Service for any activity that may adversely affect any listed species. The USFWS issues permits and can recommend further action, yet ultimately has no legal authority over the state’s decision. All fish-bearing streams are expected to have a riparian management area (RMA) between 50 and 100 feet, that includes vegetative and conifer retention. Within these riparian management areas, all fish-bearing or domestic use streams, and all other medium and large streams, require a 20-foot no-harvest buffer on each side of the stream unless stand restoration is needed. Streams are often neglected by district maintenance workers due to lack of funding or technical assistance. Aerial spraying of herbicides to kill native vegetation that competes with crop trees is common. Any combination of chemical, mechanical, and biological pest management are utilized as much as possible to eliminate pests and weeds in a cost effective and, secondly, an environmentally sound manner. A localized management structure is in place to enforce the Department of Forestry’s management plans and policies. The public has a right to hold the Department accountable for compliance with federal and state environmental laws.